There was a little green blob that floated across the radar and overhead in Wilton Manors this morning. Being watched from the front room of the house, a woman walked past with her newspaper comics page umbrella and waved hello on her way to the bus stop. Going back to the normal routine, it was time to get up and make a second mug of coffee. Stepping past the parrot cage, the thought was that here is a bird that absolutely enjoys being rained on. It is one of his favorite things in life. Orange Wing Amazon Parrots in their normal habitat can get rained on more than once a day, and they seem to truly like having it happen. It is easy to tell as this particular bird, my Oscar, will spread his feathers wide and quake with excitement as he tries to catch every last drop of precious life giving fluids. The last time the cage was cleaned, the latches holding the base were left unattached so the top could be easily carried to where ever it was needed. Today the light bulb went on. 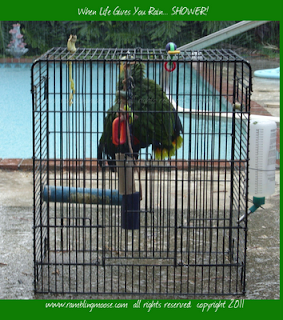 That gentle shower proceeded to become a downpour and at the peak the cage was brought into the back yard and set next to the pool and the grill. The surface of the pool water was a riot of water droplets that had smacked against it in rapid succession. He spread his wings immediately upon being set down and fluttered gently to wash his feather dust away. In the feathered world of this particular Orange Wing Amazon, this was indeed heaven. It was at that time that the kettle called from the kitchen for attention. The second mug of coffee was made and Oscar could be watched from the window overlooking the back yard. His joy apparent, Oscar began making slow loops within the cage catching water on every spot of his feathers, every part of his body. The rain began to ebb to a slow trickle, the morning's joy was complete. That was one happy parrot.